Jamie Lee Curtis didn't like being a part of Fiji Water's viral campaign. There will be no trick-or-treat candy this Halloween for the Fiji Water Girl. Jamie Lee Curtis isn't a fan. The actress took to Instagram on Tuesday night to slam the company for their "blatant promotion" at the 2019 Golden Globes. According to the "Halloween" star, she was dismayed to find out that she was photobombed by one of Fiji water's models, who is more widely known on the internet as the Fiji Water Girl. Apparently, Curtis came to learn that she was included in a photo with Kelleth Cuthbert after her husband, who "doesn't look at a lot of show business news sites," read an article on CNN about the viral story. This prompted Jamie to inform her Instagram followers that she "specifically moved away from the blatant promotions by Fiji... where young women with their trays filled with their wares stood near a designated camera." "I knew why there was a photographer poised there and I moved away as I said out loud that I didn't want to be doing advertising for either," she explains in the heated Instagram post. 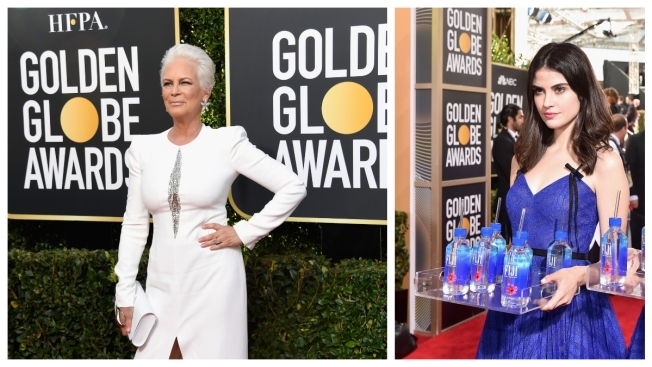 However, despite intentionally moving out of the way and voicing her desire to be left out of the photo, the 60-year-old was still photographed with Fiji Water Girl. Jamie claims, "Clearly this angle shows that I moved from her being behind me and yet from the side it still happens." The actress then suggests a way to avoid possibly angering stars. "The sponsors of events need to get permission from people when they get them to take their picture next to products," she says. Curtis is the only star to speak out against Fiji Water for their PR stunt at the 76th annual show. Actors like Richard Madden, Amy Adams and Jim Carrey were all photographed with the young model in the background, but they have yet to comment on the viral moment.